INDIA, February 28, 2019 (First Post by Dhananjay Joshi): A combing operation is conducted to weed out unwanted elements from an area. In our digital age, when narratives are built from keystrokes causing a dissonance between what we hear and what we see, let us comb the Kumbh and separate the unwanted elements from the much-tangled hair of humanity. The Kumbh I had heard of was very different from the Kumbh I saw. The Kumbh I had heard of was supposed to be stiflingly crowded, stinkingly filthy, starkly down-market and swarming with fake unwashed sadhus. So unspeakable it was, that only Indian government TV channels reported it. Civil society was dismissive about it and regaled each other ridiculing the name change from Allahabad to Prayagraj. 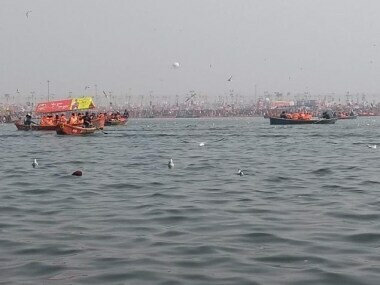 The tribute UNESCO paid to the Kumbh as the living heritage of humanity is what I actually saw at Prayagraj. It took us 78 man-hours to criss-cross and soak-in the divinity spread over 7,907 acres. There are no invites, no social media campaigns and no posts that attract the 50 million pilgrims on just that one day of mauni-amavasya alone (incidentally the Kumbh is from 15 January to 4 March, 48 days in total). The Kumbh is a sensory overload. Rising above the cacophony of sounds and sights, I saw a throbbing vibrant mass of consciousness living the timeless ritual just as their ancestors had for eons before them. But this time, there was a difference. This Kumbh was about making a difference. Making a difference to the humblest pilgrim. Making the humblest pilgrim connect with their self. Making the humblest pilgrim proud of their shared heritage. It was about giving the forgiving pilgrim a clean and safe environment. Much more of the author’s positive Mela observations at “source”.